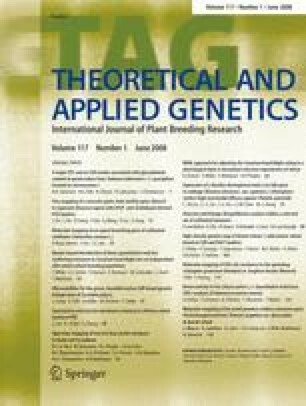 A genetic linkage map of tetraploid wheat was constructed based on a cross between durum wheat [Triticum turgidum ssp. durum (Desf.) MacKey] cultivar Langdon and wild emmer wheat [T. turgidum ssp. dicoccoides (Körn.) Thell.] accession G18-16. One hundred and fifty-two single-seed descent derived F6 recombinant inbred lines (RILs) were analyzed with a total of 690 loci, including 197 microsatellite and 493 DArT markers. Linkage analysis defined 14 linkage groups. Most markers were mapped to the B-genome (60%), with an average of 57 markers per chromosome and the remaining 40% mapped to the A-genome, with an average of 39 markers per chromosome. To construct a stabilized (skeleton) map, markers interfering with map stability were removed. The skeleton map consisted of 307 markers with a total length of 2,317 cM and average distance of 7.5 cM between adjacent markers. The length of individual chromosomes ranged between 112 cM for chromosome 4B to 217 cM for chromosome 3B. A fraction (30.1%) of the markers deviated significantly from the expected Mendelian ratios; clusters of loci showing distorted segregation were found on chromosomes 1A, 1BL, 2BS, 3B, and 4B. DArT markers showed high proportion of clustering, which may be indicative of gene-rich regions. Three hundred and fifty-two new DArT markers were mapped for the first time on the current map. This map provides a useful groundwork for further genetic analyses of important quantitative traits, positional cloning, and marker-assisted selection, as well as for genome comparative genomics and genome organization studies in wheat and other cereals. This study was supported by The Israel Science Foundation grants #1089/04 and 608/03 and equipment grants #048/99 and 1478/04. The authors thank R. Ben David for skillful assistance in the genotyping and D. Minkov for technical assistance with genetic map construction.